Dear Mill Valley School Community! Although the rain is still visiting us, spring has officially sprung! Many exciting learning opportunities and projects are happening at our school sites, all while planning for the 2019-20 school year is well underway. As shared at the March 14th Board meeting, notification of reduction and release of certificated staff has been distributed, and classified and administrative staffing ratios are currently being evaluated. The high level of engagement from our staff, parents, and community stakeholders has provided additional guidance to inform planning decisions for the upcoming school year. Meetings with specialist teachers as well as site staff and PTA groups are happening across the district to continue to respond to questions and provide clarification about some of the realigning that is under consideration. 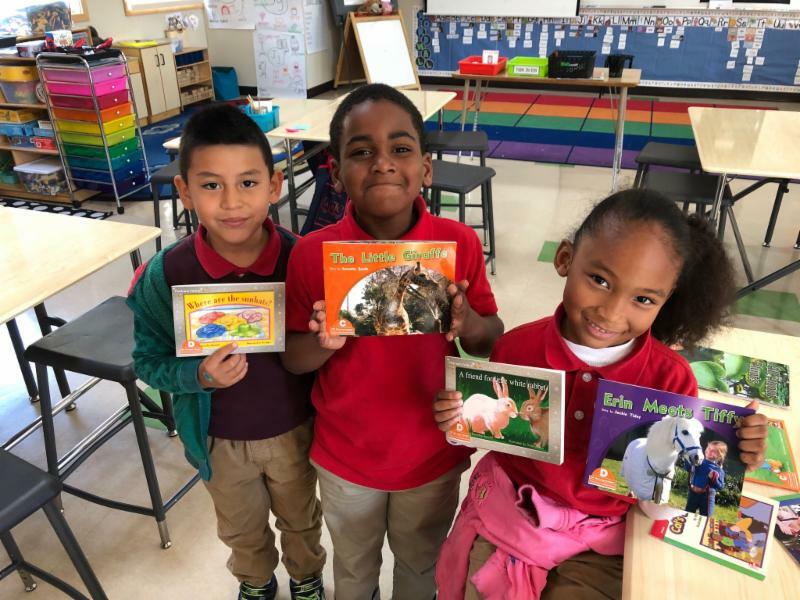 Although these reductions are difficult, please be assured that your children will continue to receive the high-level educational programming and enrichment next year that they currently receive. In the coming month, the District will send the annual community survey to solicit feedback around the four objectives of the strategic plan and our six school sites. W e appreciate your engagement in these stakeholder surveys, as this information truly informs how the district plans for the future. We had a great day of learning on March 8th for Professional Development. Staff members across the district participated in training focused on implementing restorative practices and communication, effective de-escalation strategies, and other techniques to help develop supportive and inclusive learning environments for our students. We appreciate the financial support of our PTA Council in offering this training led by a facilitator from Services that Encourage Effective Dialogue and Solutions (SEEDS) . Elementary staff members also participated in interest-based professional development centered around various topics, including global competency, technology, social-emotional learning, equity, math and science instruction, and more! Middle School staff prepared for new initiatives coming next school year. High-quality professional development such as this is a strategy in our Strategic Plan goal of Supported Staff - it develops our staff’s skills which provides valuable teaching that is able to be implemented in classrooms to strengthen student learning. The Mill Valley School District PTAs are coordinating a coin drive to support leveled "readers" for elementary classrooms at one of our neighboring school districts. Unfortunately, not all schools have access to such robust PTAs as Mill Valley to support these supplemental learning programs. This community fundraiser relates to the focus on global mindedness through taking action to assist and collaborate with our educational neighbors. 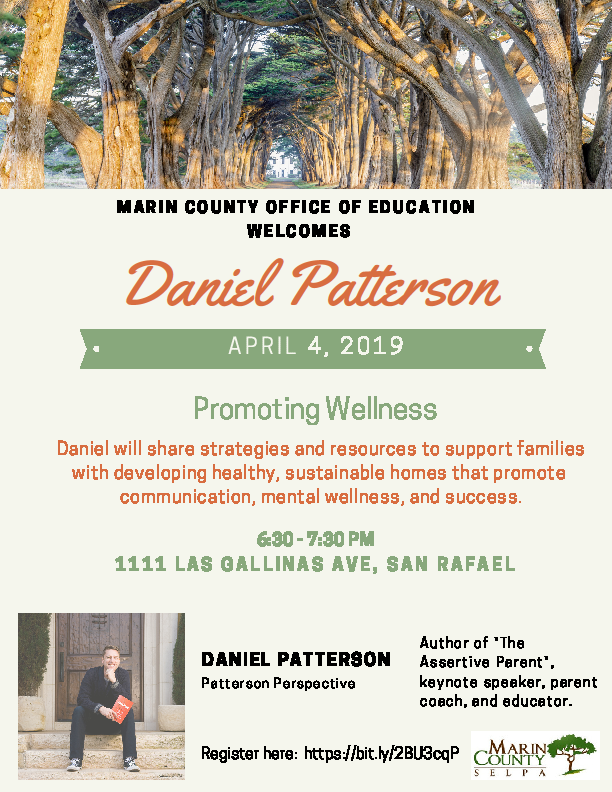 Thanks to the Mill Valley School District PTA Council for spearheading this initiative. More details will be coming on how you can help! 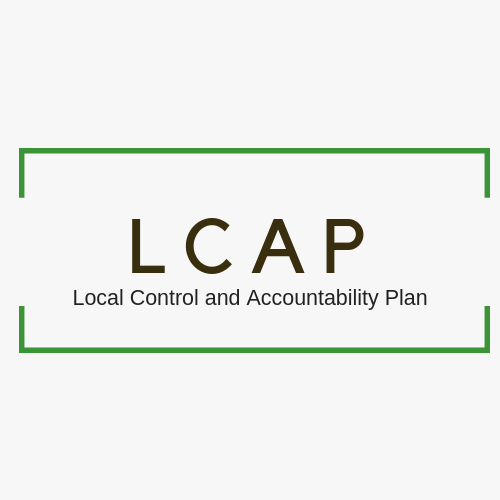 Local Control and Accountability Plan (LCAP) goals and actions! Please take the survey prior to April 5, 2019 if you wish to participate. 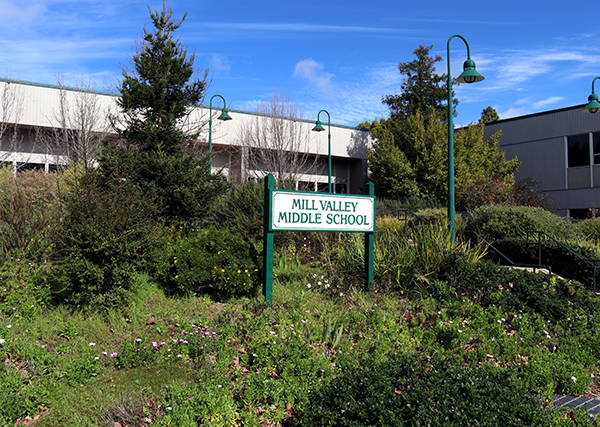 Sound Finance & Infrastructure is crucial to the Mill Valley School District in planning for the future, both for long-term financial solvency and for safe, properly-equipped, and well-maintained facilities. To support this Strategic Plan objective, the district is initiating the process to work toward a modernization construction project at the Mill Valley Middle School building. A Facility Master Planning Steering Committee has been put into action, consisting of various stakeholder groups. 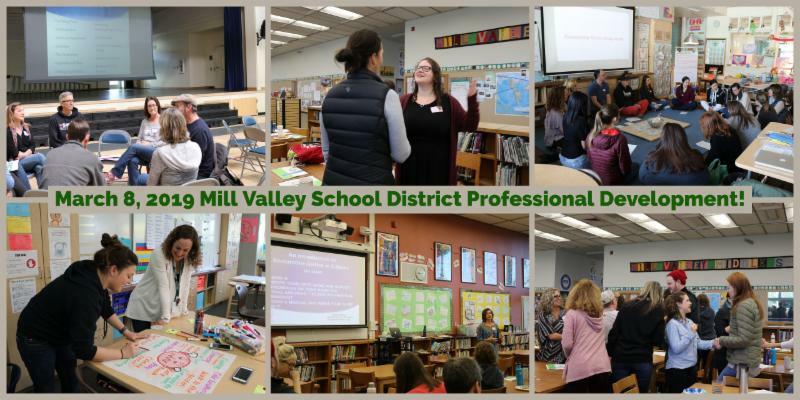 Additionally, the Mill Valley School District has been proactively planning for the 2019-20 school year, proportionally aligning staffing with projected enrollment, which is a factor in remaining fiscally responsible. This Spring, our 3rd-8th grade students will be taking the Smarter Balanced Assessment as part of CAASPP testing. This assessment is designed to provide information about our students' understanding of Common Core State Standards in English Language Arts/Literacy and Mathematics . Our website provides more information about CAASPP testing and your child’s testing schedule, as well as a parent notification letter. If you have questions about your child’s participation in CAASPP testing, please contact your child's principal. Test results will be made available to you during the summer break. 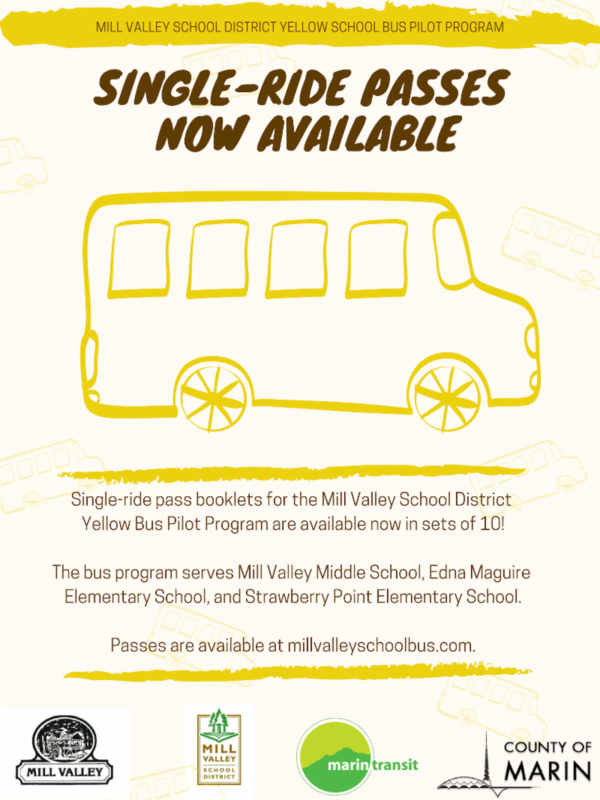 Mill Valley Middle School, Strawberry Point, and Edna Maguire families: single-ride passes for the yellow school bus are now available. Each pass is $5 and you can purchase a 10-pass booklet on MarinTransit’s website. Your child can then pick up the booklet in the school front office. These single-ride passes are perfect for after school play-dates or hangouts, keeping your child dry on rainy days, etc. Passes are only valid for the remainder of the 2018-19 school year and refunds will not be available. This is an adults-only event. The presentation is designed to support parents and caregivers of teens. Registration is required for this free event. 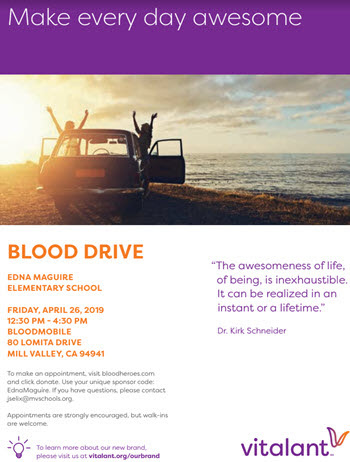 To make an appointment, visit bloodheroes.com and click donate. Use your unique sponsor code: EdnaMaguire. If you have questions, please contact jselix@mvschools.org . Appointments are strongly encouraged, but walk-ins are welcome. Please visit Vitalant's FAQ for additional information.